Everyone should want to keep their mind working at its best capacity as long as possible. A poor memory is inconvenient and frustrating. It can be embarrassing and cause concern over the possibility that a poor memory might only decline with age. This does not have to be the case. As with so many parts of your body, your memory can be exercised to keep it in tip-top condition and postpone memory loss well into the future. Memory seems to be a function of the brain as a whole, so keeping your brain well fed, well oxygenated, and well hydrated will also help to keep it functioning well. Alcohol is very bad for your mental function, so keep intake to a minimum, and avoid smoking. Smoking causes degeneration in blood circulation and limits much-needed oxygen and nutrients to the brain. 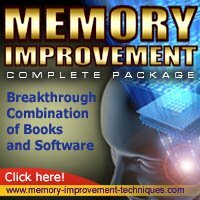 One of the best ways to keep your mind sharp and your memory working well is to use a brain training method. Studies show that elderly people who enjoy working regular crosswords or other puzzles, playing cards or chess, or exercising their minds in other ways are less likely to develop early dementia. Sitting down with the newspaper and doing the daily crossword is an excellent brain exercise. Moreover, attending regular card games or joining a chess club is not only good for your mental prowess, but also for your social life. You can purchase a brain tool or find one to use online. The hand-held type of brain tool usually offers mathematical puzzles for the user to solve, and many of the more "intelligent" ones will react and give harder problems as the user gets better at solving them. Online brain training software offer a variety of games and puzzles involving dexterity, quick thinking, and general knowledge. Five or ten minutes use each day will soon improve your mental function. Not only will you will see progress as each new challenge becomes easier for you, they are fun to use. Brain exercises work because of the brain's ability to grow and develop even late in life if it is kept active and presented with new challenges. This ability, called neuroplasticity, is more pronounced in the very young, but never entirely stops as a person ages. There is hope then, even for an elderly person whose memory has started to fail, if they are prepared to spend just a few minutes a day exercising and improving their mind.